HyperVision allows you to turn all imaginable data into an intuitive management solution for your specific situation. and make your business more profitable. HyperVision connects the dots. All the dots. Digital Solutions enables ENGIE to develop applications on platforms on a large scale. Thus allowing you to improve your operational performance and to introduce new products and services with a better customer experience. In all of our focus markets HyperVision can offer you tailor made solutions in every fase of your project. 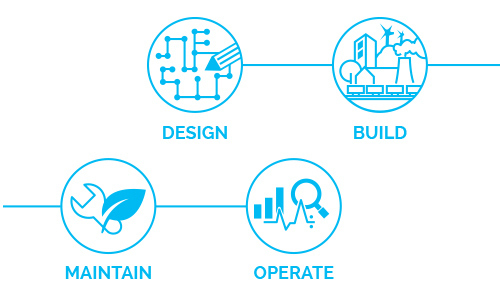 HyperVision helps you to integrate and manage all aspects of an energy grid from the power plant to the consumer. Optimise your industrial and manufacturing processes with HyperVision. Grow your efficiency by simplifying your management processes. Visualise and control buildings and cities the smart way, integrating all management tools which come with every specific service into one. HyperVision is your prime choice integration and development platform to monitor and manage vital traffic and transportation systems worldwide. HyperVision supplies you with a Unified Security System with video, access control and SCADA functions in an all-in-one user experience. HyperVision integrates all of your SCADA solutions for water, emission and waste systems into one comprehensive management platform. We like to share our experiences in your market, so let's meet.